The Master of Architecture will prepare you for a career as a professional architecture. 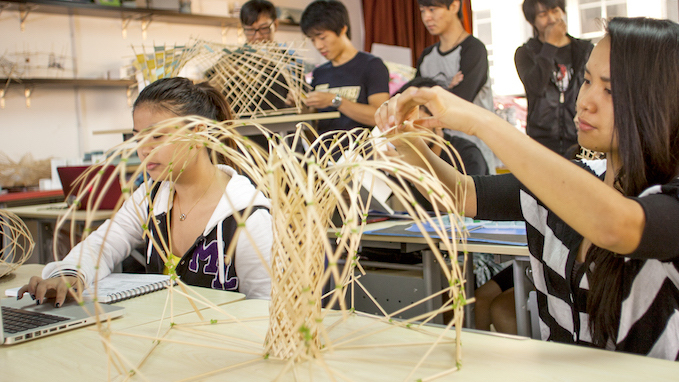 The Master of Architecture provides students with the opportunity to expand their creative abilities, technical skills, and professional knowledge necessary to become effective and respected architects in Macao and internationally. This is a comprehensive master programme that covers topics that range from digital design techniques, heritage conservation, construction documentation, management and entrepreneurship, urbanism and architectural research, with and founded appreciation of sustainability and the local/global context. It culminates with a major research and design project and dissertation, paving the way for a professional path of excellence in the field of architecture. Students should have completed the USJ Bachelor of Architectural Studies, or hold an approved equivalent qualification. A portfolio of creative work is required for application to the programme. The USJ curriculum adheres to international standards while remaining relevant to its specific location, one of the most exciting and unique urban environments in the word today. Host to incredible quantities of new construction, Macau is in an ideal position to foster the intellectual and creative capital for innovative approaches to architectural design. Architecture studios and lecture-based modules are taught by a mixture of local faculty members and eminent visiting professors. All are internationally recognized professionals, providing the opportunity to develop the creative and technical abilities necessary to become a competent professional in Macau and the wider world. Beyond instructing students in the history of the discipline and its accumulated techniques, the university provides space and time for reflection and experimentation – a platform from which to postulate alternatives, to develop unprecedented solutions to current problems, and responses to as-yet unknown ones. Addressing the full spectrum of aesthetic, technological, urban, economic, environmental, social, theoretical, and historical issues, the Architecture programme emphasize ethics as well as expertise, requiring students to constantly evaluate the consequences of their work on the built environment and the natural world. Our graduates will be good architects, but also good citizens, possessing the requisite skill and vision to contribute to the future shape of the city in which they live, for the benefit of all its citizens. This module leads students through a range of design research techniques. It focuses on key aspects of architectural and urban design, emphasizing the synthesis of construction technology, history, theory, and professional practice. Assessment is based on the comprehensiveness of the design solutions, the clarity and quality of the visual materials and student presentations, as well as the originality and creativity of the final project. This module gives students the opportunity to further explore specific issues and topics in architectural theory, with an emphasis on contemporary critical debates. Students will develop knowledge and skills by means of analysis and evaluation of recent, innovative, seminal architectural projects, and their techniques, strategies, discourses, and effects. Other topics that may be addressed include religious architecture and the history of institutional buildings. The aim is to provide a thorough technical and ethical background to theoretical knowledge required in contemporary avant-garde design studios. This module gives students the opportunity to further explore specific issues and topics in architectural and urban theory, with an emphasis on contemporary critical debates. Students will develop knowledge and skills by means of analysis and evaluation of recent, innovative, seminal design projects, and their techniques, strategies, discourses, and effects. Other topics that may be addressed include heritage studies, religious architecture, and the history of institutional buildings. The aim is to provide a thorough technical and ethical background to theoretical knowledge required in contemporary avant-garde design studios. This module addresses a range of design research techniques, implemented through a studio project for a large-scale architectural and urban complex. The studio emphasizes the synthesis of construction technology, history, theory, and professional practice. Assessment is based on the comprehensiveness of the design solutions, the clarity and quality of the visual materials, as well as the originality and creativity of the final project. Regarding any building or city as a combination of artificial and natural ecologies, students will examine relationships between architecture and urbanism in the contemporary context. This module concentrates on the principles of building structures, materials, and technology, environmental controls, and building services, at an advanced level of integrated architectural design, geared to the Macau context. For building materials and construction technology, the emphasis is on the performance criteria and applications of building materials, components and systems of construction. For building structures, the emphasis is on structural schemes systems relating to local building regulations and codes. For environmental controls and building services, the emphasis is on coordination of services for heating, ventilation, air-conditioning, fire safety, plumbing and drainage, electrical, lift and escalators, etc. Urban conditions are examined through readings of critical theories, analyses of developmental models, and empirical investigations. In conjunction with physical, historical, social, and economic research, alternative design strategies are explored to challenge existing models of urbanism. The methods and standards by which architects communicate to other partners in the building process are highly important. At every stage of a project, technical drawings (plans, sections, details) must be prepared for distribution. This module will guide students through various methods of communicating technical information about a design to the other parties involved in construction. Students will learn hands-on the everyday work of an architect, from hand sketches through to computer-based precise geometrical rationalization of building forms and the assembly of logically cross-referenced project packages. All architecture students are required to prepare and present a portfolio to an academic judging panel for assessment. The portfolio may contain examples of assignments, tests and examinations, presentations, reports, and other work done by the student. Students will be assisted in the preparation of their portfolios. All architecture students must complete two hundred and ten (210) hours of internship in an approved architecture office. The time distribution may be determined by the student together with the office (Assumed to be 6 weeks, with a workload of 35 hours but other combinations are possible). During their internship, students must keep a log of their work, and examples of their work outputs. Every student is required to present a summary of his or her internship to an academic judging panel. This module reviews the functional and operational activities and processes in typical architecture practices, and the common issues and concerns of practice managers. It will provide general knowledge of the legal obligations and bureaucractic procedures for an authorized person to practice architecture in Macau. Interaction, cooperation, or possible conflicts with other specialized practices related with project and construction will be addressed. Ethical issues for professional conduct, such as ownership of intellectual property and conflicts of interest, are considered. The module addresses issues related to architect registration; architect/client/consultant/contractor relationships; project management; tendering procedures; bills of quantities; scheduling techniques; measurement conventions; organization, management and other professional practice issues; legal responsibilities and relevant statutes. Analyses of relevant cases studies in architectural practice are also included. This double module is the culmination of the professional architecture degree. The first part comprises seminars on research methods in architecture and urban design, with the aim of preparing students to undertake a design thesis. The outcome is a proposal for an independent research and design project that takes a clear position in relation to contemporary architecture. In the second part of the module, students are required to undertake a self-directed design project under the supervision of a faculty member, in the format of a design studio that focuses on architectural and urban design techniques. These will synthetize building design, construction technology, architectural theory, and professional practice. Assessment is based on the comprehensiveness of the design solution, the clarity of the visual materials and presentations, as well as originality and creativity. In addition to demonstrating satisfactory ability in the technical aspects of architectural practice, the thesis should produce innovative work that extends and enriches knowledge in the broader field of architecture.